ADDLED is a funny, witty and literary endeavor about the goings on at an exclusive country club (Eden Rock). And at the center of it all is a gaggle of geese! The book opens with a group of men golfing on the property of the club, and an unfortunate accident occurs. Charles Lambert, a member, kills a goose while playing on the golf course, and things go downhill for him from that point on. Charles's wife, Madeline, and the elderly Arietta Wingate are in charge of the "book," which details every woman who belongs to the club and their "liaisons." The reason for this club --- whose existence is a secret known only to the two of them --- is to ensure that there are no "unwanted" couplings going on; in fact, it has saved a few embarrassing romances. In the meantime, Madeline is struggling with her marriage, and as she watches Charles sink into what everyone thinks is insanity, she does her best to keep her head held up high. But with each passing day, she fears that her marriage is about to end, and one by one her so-called friends begin to shun her. Charles has not touched her in weeks and now has shut himself away from the world, working on who knows what. He has lost interest in his friends and golf game, and instead has enrolled in sculpture classes. Another central character is Vita, a blossoming chef at the country club. She has a rather odd relationship with one of the members, a somewhat overweight man named Frank Nicastro, who loves the food Vita serves. It is her wish to please everyone in the club, and now her mission is to create meals that will be delicious yet healthy so that Frank can lose weight. Vita then comes upon a brilliant idea: Why not fatten up the geese that are infiltrating the club and serve them to the members? Kill two birds with one stone, as they say. This will please the management of the club, as well as its members. She secretly begins her mission, with some help from the staff, feeding the geese only the finest grains and making sure it all stays purely organic. She is actually inspired by Phoebe, the wayward daughter of Charles and Madeline, who believes in the vegan way of life and seems to be a throwback to the 1960s hippie movement. As was stated earlier, the geese are at the heart of the story. Their presence is never ignored or overlooked --- even Barry, who is the assistant to Gerald Wilton, the manager of the Eden Rock Country Club, has taken a stand on the geese. In fact, he is secretly raising one little gosling as his own. Gerald's mission is to figure out how to get rid of the geese, while Barry is doing his best to take care of his beloved "Forbes." ADDLED is the smartest and funniest book I've read in quite some time. Those looking for a light read will be disappointed, because it DOES take some thought to appreciate the humor in the book. 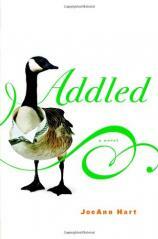 An excellent debut effort, ADDLED certainly will be on my list of favorite books of 2007.